Place the cabbage and salt in a large bowl and mix together for 2 minutes or until moisture starts to come out of the cabbage. Add the beetroot, mustard seeds and caraway and mix to combine. Add the vinegar and rosemary and mix to combine. Place the mixture in a large sterilised jar (see cook’s tips, below), pushing down firmly so that the cabbage is tightly packed with no gaps. Cut a large piece of muslin cloth. Push the muslin down firmly to separate the cabbage and any liquid. Place the jar on a tray and set aside in a cool, dark place overnight to start the fermenting process. Leave the jar on the tray at room temperature for 2 days. The sauerkraut is ready when bubbles start to appear on the surface. Remove and discard the muslin. Refrigerate until ready to use. Makes 5 Cups. + To sterilise a glass jar, preheat oven to 120°C (250°F). Wash the jar and the (metal) lid in hot soapy water, rinse and place on a baking tray. Place in the oven for 20 minutes. Remove and allow to cool before filling. 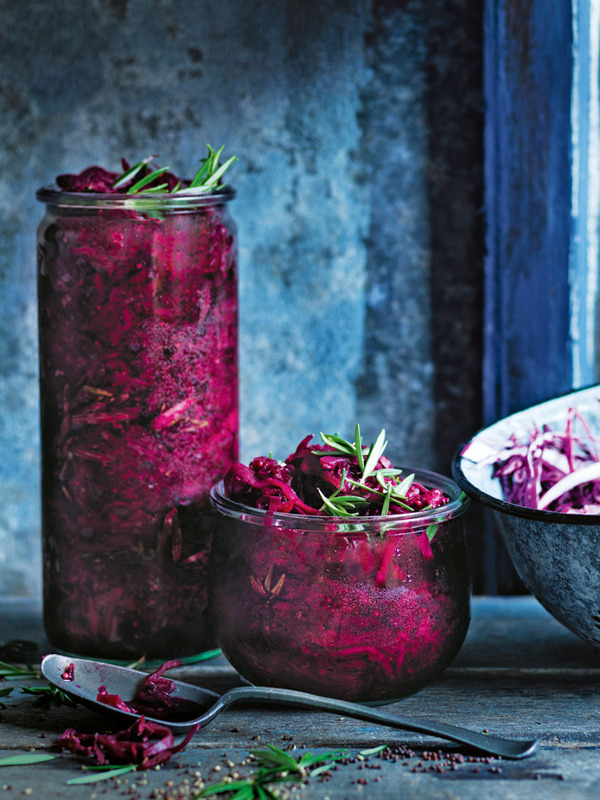 + If you prefer a stronger flavour, leave the cabbage fermenting at room temperature for a further 2 days. + The sauerkraut will keep for up to 1 month in the fridge.